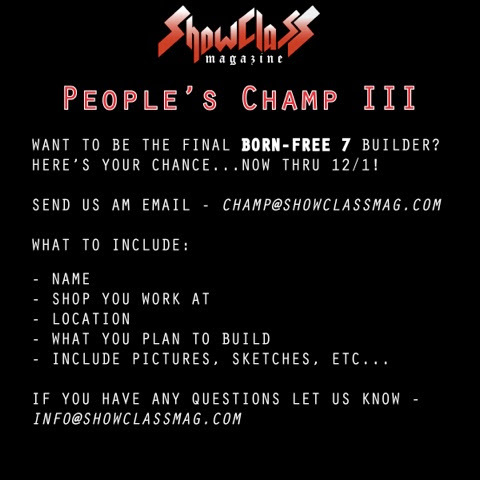 Show Class People’s Champ Deadline is December 1!!! 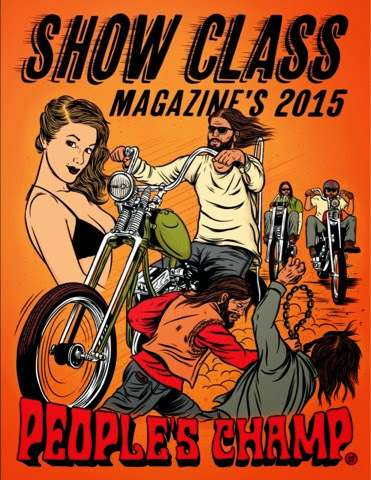 We at Born-Free couldn’t be more stoked with the Show Class Magazine People’s Champ contest now in its third year. While we try to take note of who is building what and try to find as much new blood and talent to be our Invited Builders Each year we just can’t be everywhere or know everyone which is where the People’s Champ comes in! Basically if you’ve always wanted to be or wondered what it takes to be an Invited Builder you have your chance to show your skills in a contest that gets narrowed down to a final few and the night before Born-Free 7 the winner will be picked and welcomed into our group of Invited Builders at the show. But there is a lot of hope for those that don’t “win” as we have poached many talented guys that got voted out along the way and welcomed them into our fold. So what are you waiting for??? The deadline to enter is December 1, 2014 so follow the directions here and see what happens. This entry was posted in born free 7, Peopleschamp3, show class magazine, Uncategorized. Bookmark the permalink.